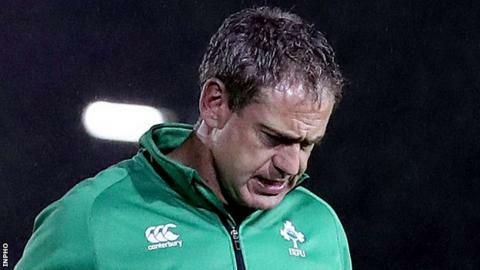 Ireland women's coach Tom Tierney has stepped down following the hosts' disappointing World Cup performance. Saturday's 27-17 defeat by Wales in Belfast in the seventh place play-off means the Irish will have to qualify for the 2021 tournament. "That was my last game," confirmed Tierney, whose three-year contract was up until the World Cup. "I'm proud of the job I've done. Obviously it hasn't ended the way we would have wanted." Despite successive defeats by France and Australia, Ireland were favourites to beat Wales at Kingspan Stadium but after taking an early 7-0 advantage, the hosts were largely outplayed during the remainder of the contest. Tierney led Ireland to the 2015 Six Nations title in his first season in charge as they pipped France on points difference. The Irish finished third in the 2016 Six Nations while they were beaten by England in the Grand Slam decider earlier this season as they took the runners-up spot. However after reaching the semi-finals at the 2014 World Cup, the Irish, as hosts, were earmarking at least reaching the last four again at this year's tournament but Tierney's side have struggled badly on home turf. Speaking to the Irish Times this week, injured Ireland prop Ruth O'Reilly criticised the squad's preparations for the tournament, saying that coach had "lost the group" prior to the World Cup. Tierney said that he had been "disappointed" by O'Reilly's comments. "The timing of it wasn't great for the players because we were trying to win a match in the World Cup," he added. The outgoing Ireland coach said that he would be involved in the IRFU's official review of the squad's tournament but said that now was not the time to get into any specifics. "Once the emotion and the exhaustion of it settles down, we'll review and we'll see where we went right and where we went wrong." Tierney did say that Ireland must aim to develop "more athletic-based players" in order to compete at the top level. "That is going to be the challenge - unfortunately not for me. My time is up. But it has been an honour to be coach of the Ireland women's team." Tierney indicated that he will be moving into another coaching position but said that he was not yet able to divulge more details.